YUM!! 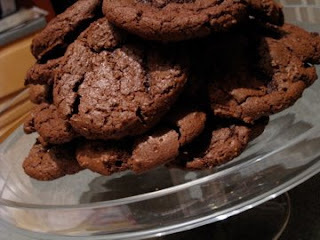 Some tastiness that I baked Saturday evening for the boys ;) These are fabulous milk chocolate cookies from Martha Stewart Cookies (which is a fun cookie cookbook)! DH and E. stayed up later than normal laughing and listening to the thunder last night. Luckily the severe cell of the bad storms missed us, but we got a great light show with lightning.